r/politics: Reddit politics mods unban Mother Jones, but not Salon, Gawker, et al. 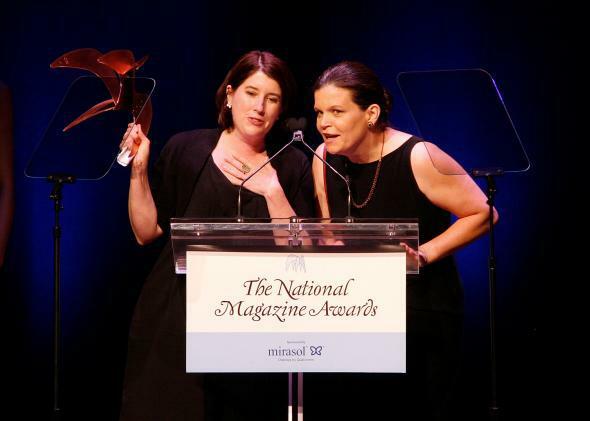 Mother Jones editors Clara Jeffery and Monika Bauerlein have won National Magazine Awards, and now they’ve won back the esteem of one of the nation’s most influential politics news sites. The volunteers who run Reddit’s most influential politics section announced Monday that they’ve taken a second look at some of the domains they banned last week, and decided to reinstate one: Mother Jones. The others, including Gawker, Huffington Post, the National Review, Reason, Salon, ThinkProgress, and Vice, are still verboten for the time being. The moderators apologized again for their handling of the controversy, which began when they added dozens of major media outlets to the “banned domains” list for /r/politics, the subreddit they oversee. The moderators originally explained that they had banned these publications based on user complaints of sensational headlines, “blogspam,” and plain “bad journalism,” but they didn’t give specifics. I and others criticized the ban last week, pointing out that, among other problems, it seemed bizarre to rule out sites like Mother Jones that produce award-winning investigations while continuing to support links to tabloid machines like the Daily Mail. The moderators first apologized in a post on Saturday, promising changes to the controversial policy. The fact is that this policy has flaws. Some of the criticism is correct. Admitting that isn’t bending to pressure; that’s being reasonable. That’s true, and the moderators’ willingness to reevaluate a big decision in the face of a backlash seems like a good sign for the future of /r/politics. And, just maybe, it’s a promising omen for the future of Reddit as a whole, though it’s important to note that what happens on one subreddit doesn’t necessarily have anything to do with the rest of the site. Each subreddit is run by volunteer moderators who take responsibility for making and enforcing the rules for that section. The “bad journalism” fiasco is noteworthy because it highlights how much power these volunteers have to redirect the flow of traffic on the Web, sometimes based on criteria that are ill-defined and poorly understood. On the other hand, the moderators’ relatively quick and mostly level-headed response suggests that they’re not as unaccountable as some of their critics might have feared.